The first of Royal Caribbean's five Voyager Class ships, Voyager of the Seas, was a true innovation when she originally debuted. Among the amazing on board features was that it was the first ever cruise ship with a Royal Promenade, ice-skating rink and rock-climbing wall. Today, Voyager remains one of the most feature-filled and largest cruise ships in the world, providing a fun and affordable vacation option. Since May 26, 2012, Voyager of the Seas features the popular Dreamworks Experience on each of its cruises. This exciting program features special events and parades, interactive character breakfasts in the main dining room, and photo opportunities with characters. Possible characters include those from “Kung Fu Panda,” “Shrek,” “Madagascar” and “How to Train Your Dragon." 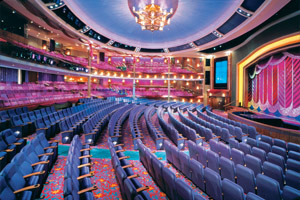 Among the many entertainment venues on board Voyager of the Seas are its three-level main show lounge, Coral Theatre, which hosts a live performance during each evening. Possible shows include elaborate Broadway-style productions, comedians, singers, dancers, acrobats and even game shows that involve the participation of guests. Also on board Voyager is a large casino, full-service day spa and fitness center, swimming pools, whirlpools, 9-hole mini-golf course, duty-free shopping boutiques, library, card room, photo gallery and internet cafe. 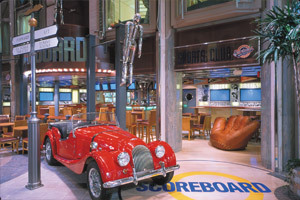 There are many bars and lounges aboard Voyager of the Seas. 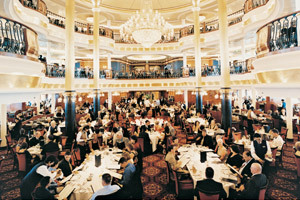 Among them are Royal Caribbean signature venues such as the Schooner Bar and Viking Crown Lounge. Also on this ship is The Vault, a two-level night club that's open until the early morning, as well as the Champagne Bar and Pig & Whistle Pub (a traditional pub where guests can enjoy a pint while listening to live music). 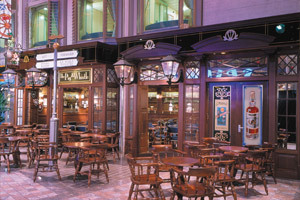 You should never run out of dining options while on a Voyager of the Seas cruise. 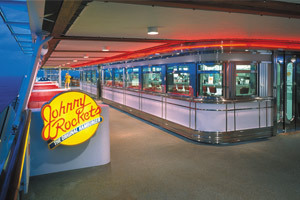 There's a three-tiered main dining room, the Windjammer Café (which has a large buffet, with a wonderful variety of options), specialty dining options (Portofino, an upscale Italian restaurant, and Johnny Rockets®, a '50s-style diner), as well as 24-hour room service. Scheduled for May 18, 2014, Voyager of the Seas is going to receive a variety of onboard enhancements. Among the upgrades will be the addition of an outdoor movie screen, an updated Vintages Wine Bar, the addition of a few restaurants (including Park Cafe, Chef's Table, and Giovanni's Table), digital signage, pervasive Wi-Fi, flat-screen TVs, a nursery, as well as a Concierge Club and Diamond Lounge. The heart of Voyager of the Seas is its Royal Promenade, a 4-story mall-like area that's lined with various stores, bars, lounges and casual eateries. In this area is Café Promenade, Pig & Whistle Pub, Ben & Jerry's ice cream, Scoreboard Sports Bar, the Champagne Bar, a general store, a jewelry and gift shop, and more! This innovative venue is open 24-hours a day, so you'll always have somewhere to hang out while on your cruise. If you're feeling lucky while on a Voyager of the Seas cruise, you may end up spending some time at the ship's large, Vegas-style casino. Among the many games of chance available there are Blackjack, Roulette, Craps, Caribbean Stud Poker and a variety of slot machines. During a typical cruise on this ship there are even gaming tournaments, often including exciting games such as Texas Hold'em. This is a multipurpose studio complex that's home to Centre Ice Rink, where guests are able to ice skate during the cruise. There are even performances during a Voyager of the Seas cruise by the ship's professional ice skaters. 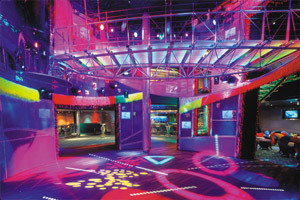 Also in this venue, there are various shows that may occur, such as cooking demonstrations. 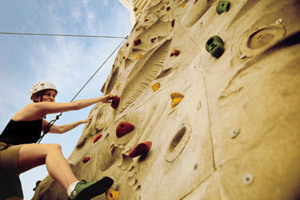 Those sailing aboard Voyager of the Seas have the opportunity to enjoy the ship's large rock-climbing wall. There are paths of different difficulty levels, which allows passengers of all skill and comfort levels to try climbing up it. 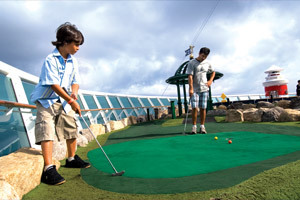 Since Royal Caribbean is a family-friendly cruise line, they made sure that there is plenty for children and teens to do while on a Voyager of the Seas cruise. There's a video arcade, full-size basketball court, as well as a playroom with toys, books and a wonderful variety of activities (run by a well-trained staff). Also on board this ship is a teen center, with a lounge that's a popular place for teens to make new friends during the cruise. 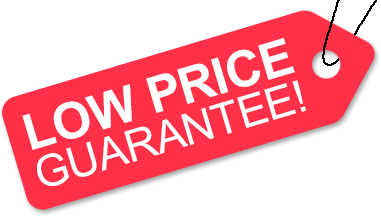 Low Price Guarantee on all Voyager of the Seas Cruises! Book any Royal Caribbean cruise with us and you'll get the best deal possible, regardless of the ship or sail date! Because of our "Low Price Guarantee," nobody beats our Voyager of the Seas cruise prices, so look around and you're sure to find the best Voyager of the Seas cruise deal possible when booking with us! Pre-Paid Gratuities on Voyager of the Seas Cruises! Select reservations qualify for Pre-Paid Gratuities for the 1st & 2nd guest in each stateroom. That's a big savings on a cruise vacation! Go to Step 3 of the online booking process to see which categories qualify. Voyager of the Seas Onboard Credit Sale! Get an Onboard Credit when you book a Voyager of the Seas cruise with us. The value of the Onboard Credit depends on the particular cruise and accommodations you book. Onboard Credit values are listed on Step 3 of the online booking process. We do not charge booking fees on any cruises! 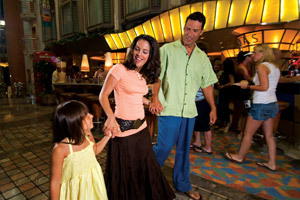 You're sure to enjoy an affordable Voyager of the Seas cruise when booking with us! Our special offers on Voyager of the Seas cruises may not be combinable. Certain restrictions apply to each offer. View terms and conditions during the online booking process. Click a price below to view the Voyager of the Seas cruises during that month in that destination. Separate bedroom with king-size bed, private balcony with hut tub, whirlpool bathtub, living room with queen-size sofa bed, baby grand piano, and concierge service. Two bedrooms with twin beds that convert to queen-size beds (one room with third and fourth Pullman beds), two bathrooms (one with shower, one with bathtub), living area with double sofa bed, private balcony, and concierge service. To reserve this stateroom, please contact us (as it cannot be reserved by booking online). Queen-size bed, private balcony, separate living area with queen-size sofa bed, private bathroom with bathtub, separate shower and bidet, and concierge service. Two twin beds (can convert into queen-size), private balcony, sitting area (some with sofa bed), and concierge service. Two twin beds (can convert into queen-size), private balcony, bathroom with bathtub, and a sitting area. Some staterooms are handicap accessible. Two twin beds (can convert into queen-size), private balcony, sitting area and a private bathroom. Two twin beds (can convert into queen-size), private balcony, sitting area with sofa, and a private bathroom. Please note: Staterooms 8410, 8710, 9404 and 9104 have smaller balconies. Two lower twin beds that convert to Royal King. Curtained section with bunk beds. Living area with double sofa bed, vanity and sitting area. One and a half baths with shower. Floor to ceiling wrap around panoramic windows. Two twin beds (can convert into queen-size), additional bunk beds in separate area, separate sitting area with sofa bed, and a private bathroom with shower. Two twin beds (can convert to queen-size), sitting area with sofa, vanity area and a private bathroom. Two twin beds (can convert into queen-size), sitting area with sofa, vanity area, and a private bathroom. Bowed windows with a view of the Royal Promenade, two twin beds (can convert into queen-size), sitting area with sofa, vanity area and a private bathroom. Interior Stateroom with a Virtual Balcony, a high-definition screen that spans nearly floor to ceiling, providing real-time views of the ocean and destinations. Two twin beds (can convert into queen-size), sitting area with sofa, vanity area, and a private bathroom. Stateroom has third Pullman bed available. Stateroom has third and fourth Pullman beds available. Stateroom with sofa bed and third Pullman bed available. Stateroom has four additional Pullman beds available. Deck plans are subject to change. The deck plans of Voyager of the Seas provided on this page represent those through April 2017. For deck plans prior to or after this date range please contact Royal Caribbean directly. We reserve the right to correct errors. Please verify all information with the cruise line directly. For photos of staterooms, please click the accommodations tab provided above. Ship is subject to modifications.